This lesson can be used as a pre-lesson for the A Living Timeline: The American RevolutionLesson plan. Revolutionary War: a conflict between the British government and the 13 colonies"
Students will be able to draw visuals and complete sentences with content-specific vocabulary using word banks and sentence frames for support. Tell students that they will be preparing for future history lessons by studying vocabulary words and making a timeline. 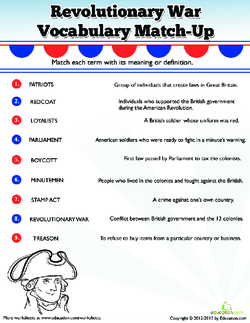 Explain that one of the most challenging things about studying history is that there is a lot of new vocabulary to learn, so in today's lesson they will be studying some key words they will be seeing and hearing in future lessons about the Revolutionary War. 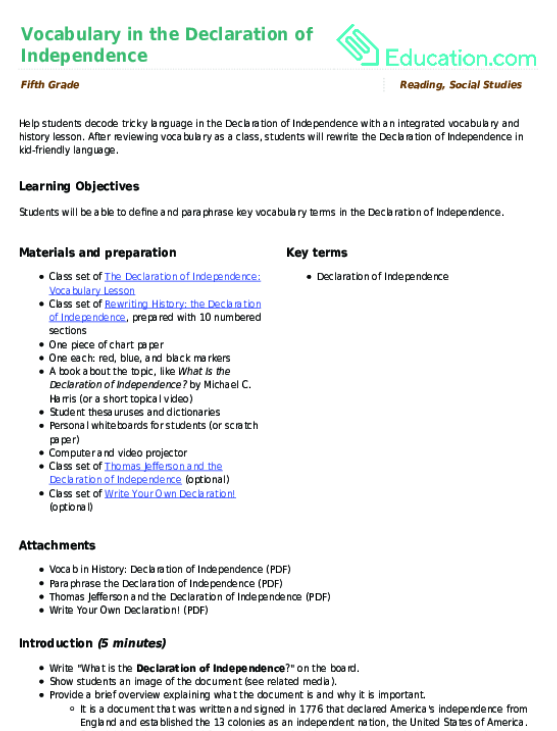 Give students a brief background about the Revolutionary War (e.g., "It was a war that took place in the 1700s between Great Britain and the 13 colonies, who wanted to declare independence from British rule. It is referred to as the Revolutionary War or the American Revolution."). Show students a map and point out Great Britain and the original 13 colonies. Review students' background knowledge about the colonies if applicable. Show students the vocabulary card for the word TimelineAnd read the definition aloud. Then, display a blank Frayer Model and show students how to complete it with the word "timeline." Split students into nine small groups and hand out one of the remaining vocabulary cards to each group. Tell students that they will be working with their group to complete a Frayer Model for their assigned word. Explain that they will be "word experts" for their word and that they will be teaching the rest of the class about it when they are done. 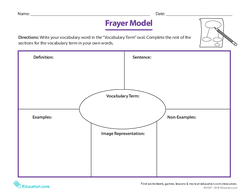 Hand out a blank Frayer Model to each group and make other resources available as needed (e.g., dictionaries, history books, bilingual glossaries). Circulate and offer support as groups work to complete the model. When all groups are finished, have students return to their seats. Hand out a blank sheet of white printer paper to each student and show them how to fold it into eighths, so that they end up with two rows of four squares on their paper. Invite a group to display their Frayer Model and present their word. As they present, instruct the rest of the students who are listening to write the word in one of their eight squares and draw a picture that will help them remember its definition. 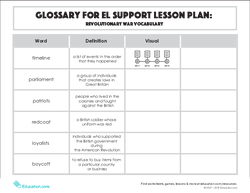 Hand out the Revolutionary War Vocabulary worksheet and instruct students to complete it with a partner who was NotIn their original word expert group. Remind students to use their drawings to help them complete the worksheet. Review the worksheet with the class and correct misconceptions as needed. There is no sentence level focus for this lesson plan. 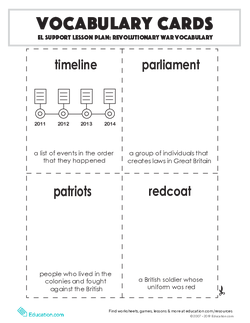 Tell students that they will now use the vocabulary they studied within the context of sentences to complete a timeline of events leading up to the Revolutionary War. 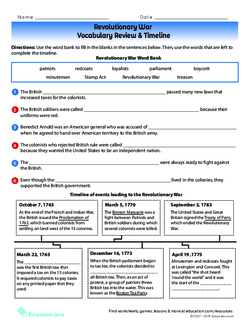 Hand out the Revolutionary War: Vocabulary Review & Timeline worksheet and review the instructions at the top of the page. Model the activity by completing the first sentence with the class. Then, instruct students to complete the remaining five sentences with a partner. Remind students to use their vocabulary worksheet and drawings to help them with the activity. Review the sentences with the class and correct misconceptions as needed. Read through the timeline with the class and fill in the three blanks with student input. Discuss the structure of the timeline and the purpose of a timeline in a history lesson (e.g., it shows key events in the order that they happened / a timeline helps us organise important events when we are studying a particular time period in history). 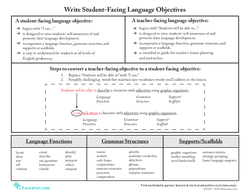 Post sentence stems to support students during speaking tasks, like whole group discussions (i.e., "The purpose of a timeline is..."). Provide definitions for additional vocabulary words that students will encounter on the worksheets (i.e., "increased," "rejected," "accused," "independent"). Show beginning ELs visuals for each vocabulary term before asking them to draw their own pictures. Play a drawing game similar to Pictionary to gauge students' understanding of the ten vocabulary terms. 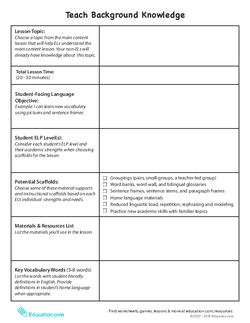 Display a full list of the vocabulary words without definitions or images. Split the class into two groups. Call a student volunteer to the front of the room and hand them a vocabulary card. Instruct them to draw a picture on the board that will help the class guess the word. Have the student volunteer confirm the word before reading its definition aloud. Repeat with the remaining nine words. Remind students that, in history lessons, they will need to know specific vocabulary in order to understand the content of the lesson. With student input, review the ways in which students can learn new vocabulary words (e.g., using dictionaries, drawing a picture, creating a list of examples and non-examples, playing vocabulary games). Explain that timelines are important text features that they will see in history books. Ask students to define the term "timeline" orally with a partner. Then, call on a volunteer to share their definition.